Connie has trouble with time. She always has to stop and think a minute: How old is she now? . . . Faith always seems to know, though her life is the same as Connie’s: back and forth to theater towns all over. The same dingy food, the same noisy sidewalks, the same cramped suites in the same hotels. . . Sometimes they go to school, sometimes not, though they always have books to read: big packets of books that Armand sends to them in every city. Armand is their parents’ lawyer, the only person they know who likes children. . . . Faith and Connie endured the same childhood as daughters of egocentric, semi-famous actors who can scarcely take care of themselves. But the two sisters could not be more different. Connie learned to beg for attention, clamor for approval, and fill the silence with words. Faith turned inward, shrinking from the tender emotions that make up an ordinary life. Despite their differences, the sisters came to rely on each other exclusively. But lately, after years of quiet connection, Faith and Connie seem to have lost the ties that once held them close. Faith has a home and two growing sons, but is still unable to fathom unconditional love. Connie, a flight attendant, is always searching, ever-expecting to find her true place in life at the end of each long flight. But a series of shocking, revelatory events will bring the sisters back to each other—and forever alter how they define love, fulfillment, and most importantly, family. 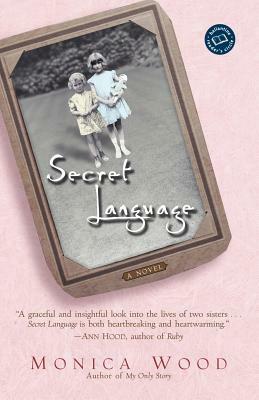 Monica Wood is the author of several books, including the novel Secret Language and a guide for fiction writers, Description. Her short stories, some of which have been nominated for the National Magazine Award and read on public radio, have appeared in such publications as Glimmer Train, Redbook, Manoa, Yankee, Best American Mystery Stories, Twenty Timeless Stories, and Sudden Fiction International. She won a 1999 Pushcart Prize. A native of Mexico, Maine, she lives in Portland with her husband.